If there is one thing that we all have in never-ending piles, it is laundry. Unfortunately, laundry detergent is made with loads of toxic chemicals. We used to use Tide liquid detergent; then we got the Think Dirty app. This app is a must have for all families who are seeking to create a toxic-free environment in their home. Using this app, you can scan the barcode of cleaning products (and other items that you have around your home) and see the list of ingredients and the corresponding toxicity rating (0-10) for that item. Ideally, you want your products to be between a 0-3. Most laundry detergents are a 9 or 10! Gross! Most commercial detergents include ingredients such as boric acid (which is harmful to reproduction), laureth, ethanolamine, artificial fragrances (which are the cause of many allergies), lauryl glucoside, and methylisothiazolinone. We made the decision to improve our health, and switched to Young Living's Thieves laundry detergent. This stuff is AMAZING. We wash our laundry with this exclusively now and love the results. It even smells good (not like chemicals). It is safe for all fabrics: towels, jeans, cotton, every the hubby's dress shirts. Everything comes out of our washer smelling clean and fresh - and chemical free! It is also safe for high efficiency (HE) washing machines, which is a big deal. It is highly concentrated, so I only use 1/4 cap per load. The laundry detergent that you use really matters. We wear clothes every day, and, as a result, we wear our laundry detergent every day. The detergent chemicals rub off on our skin, which thereby impacts every cell in our bodies. 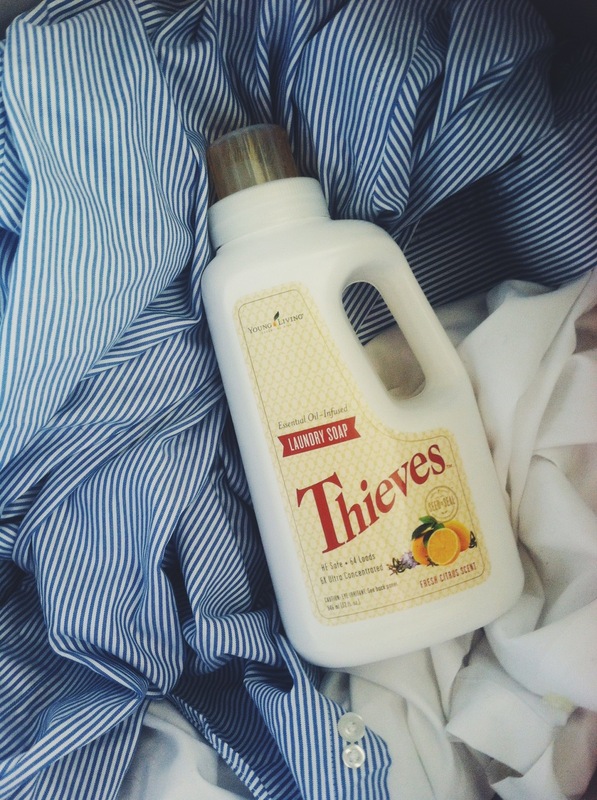 Young Living's Thieves detergent is infused with essential oils, so it not only smells good, but it also boosts our health. We also switched our fabric softener. Like most people, we used dryer sheets for years. However, after some research, we decided they needed to go to. We switched to wool dryer balls, which you can find here. These dryer balls last for over 1500 loads (talk about a long-life), plus they shorter the drying time, which means you save on electricity too. It's really a win-win situation. We like to put a few drops of lavender or Purification on each dryer ball (we typically use three per load), so our we end up with lavender scented cardigans, and believe me, it is so good.